Whatever your lifestyle, the i-See is sure to bring amazing clarity that you'll appreciate. Read newspapers, magazines, or the latest book from your favorite author. In the kitchen, you can view food labels and follow recipes from a cookbook from the comfort of your home. Relax doing needlework or seeing the finest details of stamps, coins or even your usual crossword puzzle. The iSee was developed with Enhanced Definition Technology which produces superior picture clarity. The iSee Desktop Video Magnifier offers adjustable magnification from 4x to 70x and 5 different high-contrast color combinations. It also offers 3 different natural color combinations to suit individual user needs. It offers auto focus and monitor tilting for comfortability. 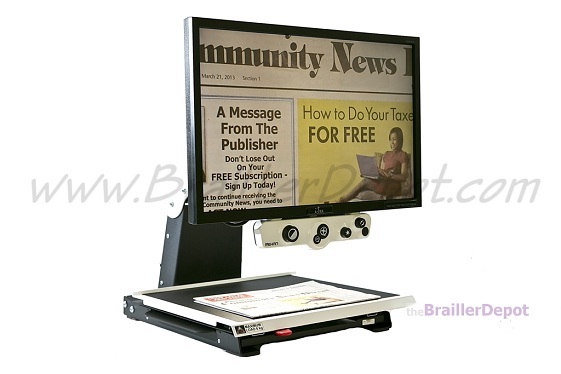 © 2018 the BraillerDepot, LLC | Over a Decade of Experience Integrating Systems for the Visually Impaired.